Thank you for assembling all of this information. As a solo traveler I often use public transportation to go to / from the trail. New England is great for bus service to small college towns near the trail. I have wanted to do HF to Duncannon leg and this information will lessen the my research time. My favorite use of Amtrak is the Empire Builder out of Chicago to Glacier NP. The 30 hour train trip drops you right off in West Glacier depot and from there it is a 2.5 mile walk into the park and the park free shuttle center. Excellent description! 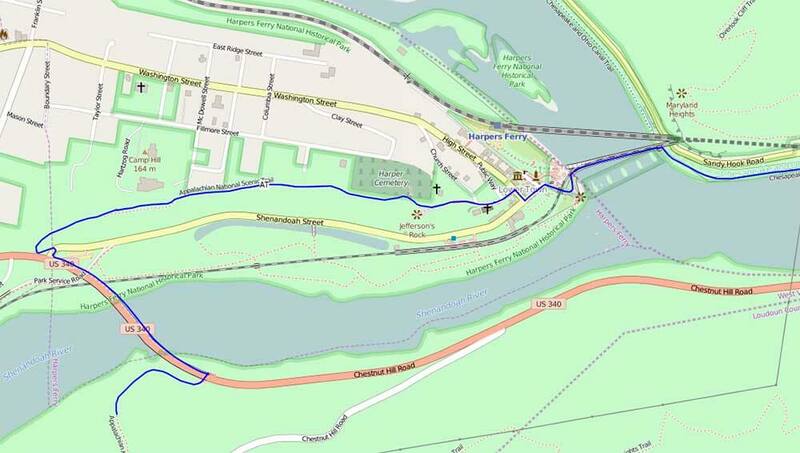 I’m planning to solo hike from Harper’s Ferry to PenMar in September and am using your reviews and recommendations to pack lightly and prepare physically. It’s good to know that there will be plenty of water sources. All went great! Ran into some nasty rocks after Pogo and a few days of rain. But you prepared on us for the hike with your detailed itinerary. Loved the coffee shop in Harpers Ferry too! At the end of February, I used this guide as inspiration for a 3.5-day shuttle hike on the AT north of Harpers Ferry. 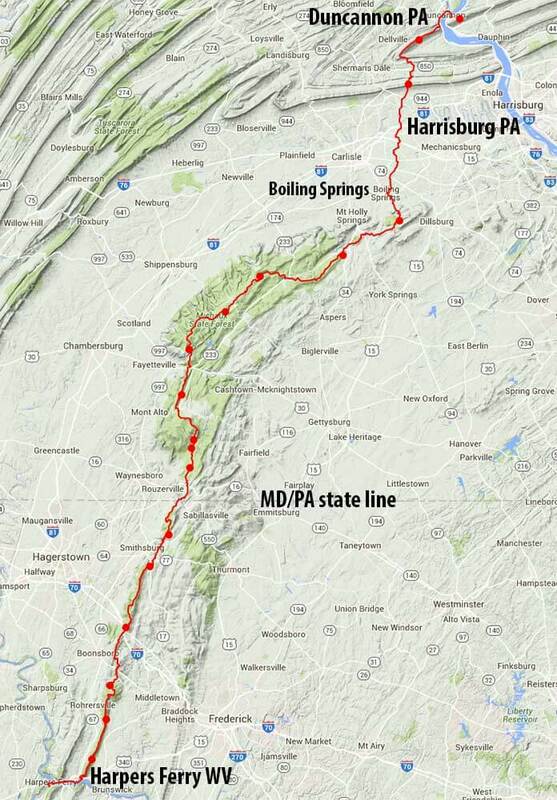 My plan was to combine the hike with a business trip into DC, driving to Harpers Ferry and then using Amtrak to reduce the carbon impact, parking fees, and hassle of navigating DC traffic. Parking at the Harpers Ferry visitors center cost $10, with a free NPS shuttle down to the historic city center and a short walk to the railroad bridge into MD. That first afternoon’s hike took me from Harpers Ferry to the Ed Garvey shelter, where I arrived and set up my hammock after dark. The combination of a Jarbridge 3-season underquilt, a Thermarest Z-lite Sol pad, and an REI Halo 25 sleeping bag (unzipped and used as a quilt) over kept me quite warm, even with temperatures in the high 20s and wind speeds gusting up to 30 mph. My tarp (an ENO ProFly) did little to block the wind, and I didn’t bother rigging it for the rest of the trip. The next day, I found out that weekend hikes in Michigan had not prepared me for AT elevation changes, and I was really starting to hate the omnipresent rocks on MD trail slopes by mid-afternoon. (Among other things, the noise of my poles’ carbide tips skating on rock was growing very tiresome. Next trip East, I’ll bring rubber pole tips.) I limped into the Pine Knob Shelter in the late afternoon with insufficient ambition to push on until nightfall, slung my hammock and was asleep only shortly after nightfall. The next morning, I took the NPS shuttle back to my car, swapped my pack for a suitcase (and my hiking clothes for business casual), shuttled back downtown and caught the Capitol Limited to DC. If you haven’t had the opportunity to travel by rail after a backpacking trip, I can highly recommend it: plenty of leg room, lots of scenery passing by your window with absolutely no leg work required, and dual electrical outlets to recharge all those devices that haven’t seen wall power in several days. All for $10 each way. Four days later, the Capitol Limited dropped me back off in Harpers Ferry. After a nights stay at the Towns Inn, I walked a couple more miles along the AT and Lower Town trail (past Jefferson Rock and interrupting a flock of whitetail deer during their morning forage) back to my car, and the long drive home. And now, instead of remembering how my quads felt every time I took another downward step on the AT, I’m shopping for lighter gear, shaving grams off my packing list, and planning the next family hiking trip (where my endurance and ego are unlikely to be the driving factors for the attempted mileage). At least this hobby is only moderately expensive, and one that I can share with my wife and son! Somehow I am just stumbling upon your site now. It is amazing – congratulations and thank you! I am looking at doing this section. Did you only take your hammocks? You would recommend? I love your gear lists. Mind sharing your favorite hex tarps? Len, glad you found the guide useful. We only took our hammocks. They are our first choice when backpacking on the AT (even in winter). You can see more of why here: Hammock Camping Part I: Advantages & disadvantages versus ground systems. That being said, a tent is just fine for the AT. And if you already own one, it will be a lot cheaper :-) than kitting out with a hammock. You can see more on my shelter preferences here: Recommended Tents, Tarps, and other Shelters. My favorite hammock tarp is the basic Hammock Gear Dyneema (Cuben) Fiber Hex Tarp. But some prefer tarps with doors like the HG Standard Dyneema (Cuben) Fiber Tarp with doors. My wife and I are going to try the train and the hike. My wife has a cousin that lives close to Harper’s Ferry. So we thought it would be a really nice trip. We plan on only going 20-30 miles since our vacation time is short. So what time of the year is the best? We were thinking in the fall like the first of September. Your Thoughts? My wife and I are hiking this trip this coming summer. Thanks for the great article and photos. We can hardly wait! Wish I’d seen this post before I did this section. Very nice, well laid out, and superb descriptions. When and if I do this part again, I will take the train. Completed the unfinished sections between Duncannon and Pen Mar after 38 years. Love this section. Boiling Springs a real joy! The cemetery you showed is pre-civil war. Many where buried 20-30 years before Gettysburg campaign. Plan to hike Maryland section next year. Amtrak from Cleveland to Harpers Ferry then shuttle to Pen Mar and hike back to ATC and train back to Ohio. Thanks for this fantastic description and photos. Outstanding, maybe the best trip description I’ve ever read. Thank you.